Yesterday I went to court after work to challenge my ticket. I wasn't sure what I was going to say, since I did run the red light, but I was thinking something along the lines of how it wasn't "in the spirit of the law" and then yelling at the judge "you can't handle the truth!" I was also planning on saying "objection" and "leading" as much as possible. But luckily my case was dismissed. I guess the motorcycle cop didn't want to show up to a 6:30 hearing. 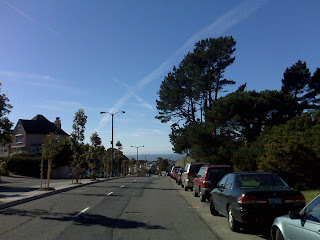 Today I rode all the way up Market to 1801 Vicente via Portola. Then rode back the same way. I ride up Portola a few times a month, but can't remember the last time I went down. I could see the ocean.